© Jiji Press/AFP/Getty Images Police and rescue workers search for survivors from a house that was damaged by a landslide caused by an earthquake in Atsuma town in Hokkaido prefecture on Sept. 6, 2018. At least one person was killed and 32 were missing, Japanese media reported, after a powerful earthquake paralyzed the northern island of Hokkaido on Thursday, triggering landslides and knocking out power to its 5.3 million residents. Public broadcaster NHK reported the first confirmed fatality and said 120 people had also been injured after the 6.7-magnitude quake. The number missing had earlier been put at 19. Aerial footage showed dozens of landslides exposing barren hillsides near the town of Atsuma in southern Hokkaido, with mounds of reddish earth and fallen trees piled up at the edge of green fields. The collapsed remains of what appeared to be houses or barns were scattered about. The entire island was without power after Hokkaido Electric Power Co said it conducted an emergency shutdown of all its fossil fuel-fired power plants following the quake. The utility said it wasn't clear when electricity would be restored to 2.95 million households. The trade and industry ministry told the utility to restart the coal-fired Tomato-Atsuma power plant within a few hours, Trade Minister Hiroshige Seko said. All trains across the island were also halted. Roof tiles and water could be seen on the floor at Hokkaido's main airport, New Chitose Airport, which would be closed for at least Thursday. New Chitose is a major tourist gateway to the island, known for its mountains, lakes and abundant farmland and seafood, and more than 200 flights and 40,000 passengers would be affected, Kyodo News Agency said. The closure comes just a couple days after Kansai Airport, an important hub for companies exporting semiconductors near Osaka, in western Japan, was shut after it was hit by Typhoon Jebi. Prime Minister Shinzo Abe said officials hoped to reopen Kansai Airport for domestic flights on Friday. The quake, which hit at 3:08 a.m. (1808 GMT Wednesday), posed no tsunami risk, the Japan Meteorological Agency said. The U.S. Geological Survey said it struck some 68 km (42 miles) southeast of Sapporo, Hokkaido's main city. It registered a strong 6 on Japan's 7-point earthquake scale. Abe arrived at his office before 6 a.m. and told reporters his government had set up a command center to coordinate relief and rescue. Sounding haggard, Abe said saving lives was his government's top priority. The Tomari Nuclear Power Station, which has been shut since a 2011 earthquake and tsunami, suffered a power outage but was cooling its fuel rods safely with emergency power, said Chief Cabinet Secretary Yoshihide Suga. Operator Hokkaido Electric reported no radiation irregularities at the plant, Suga told a news conference. Farming and tourism are two of the island's biggest economic drivers, but there is some industry. Kirin Beer and Sapporo Beer both said factories were shut by the power outage, although they said no structural damage was found. A fire broke out at a Mitsubishi Steel Mfg Co plant in the city of Muroran after the quake but was mostly extinguished with no injuries, a company official said. A series of smaller shocks, including one with a magnitude of 5.4, followed the initial quake, Japan's Meteorological Agency said. 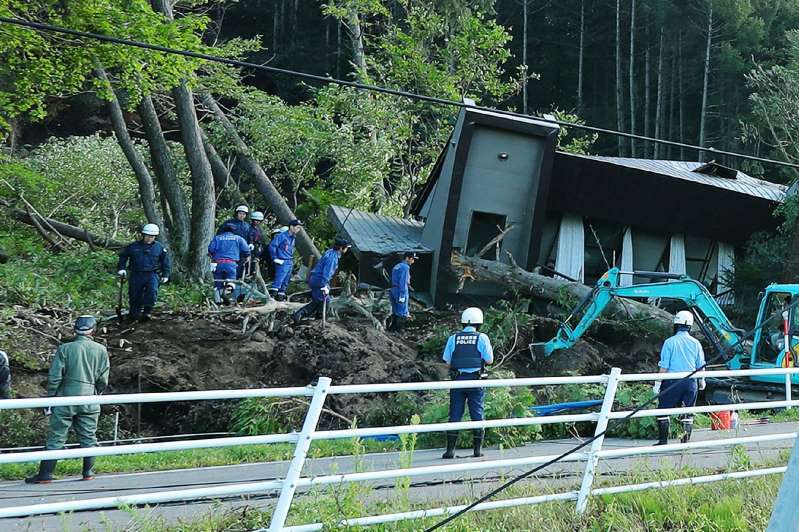 Agency official Toshiyuki Matsumori warned residents to take precautions for potential major aftershocks in coming days. Japan is situated on the "Ring of Fire" arc of volcanoes and oceanic trenches that partly encircles the Pacific Basin and accounts for about 20 percent of the world's earthquakes of magnitude 6 or greater. A 9.0 magnitude earthquake, the most powerful ever recorded in Japan, struck on March 11, 2011, off the coast of the northern city of Sendai. It set off a tsunami that devastated communities along the Pacific coast and killed nearly 20,000 people. The tsunami also damaged the Fukushima Daiichi Nuclear Power Plant, leading to a series of explosions and meltdowns in the world's worst nuclear disaster for 25 years.